Wisdom of yoga meant only years of ritual practices without human values. He brought new light. Religious bigotry, outweighing hum.an values ended.He stressed on- “Love Moving the World.”Sri Sri even as child, He would say, “I have family everywhere. People are waiting for me.”Gurudev” happily sitting “On The Plateau of Peak” brings peace and harmony to millions.These people across globe find solace in HIM.The Art of Living foundation has establishments in 152 countries.This blog is about the Gurudev Sri Sri Ravi Shankar founder of Art of Living Foundation Biography! Pujya Sri Sri Ravi Shankar ji, affectionately called as Guruji’s life story has all the elements of an enlightened Master. Millions all over the world in excess of 152 countries across the globe throng eagerly to hear Him and have Darshan. It gives me great pleasure like many of the followers of Sri Sri to share with you, my experience of reading this great biography of Sri Sri Ravishankar. Breaking all the barriers we humans have set; He moves with His one message “Love Moves The World” His mission is “bring smile in every face”. From the earliest childhood He was crying “People are waiting for Me” Reports the author Bhanumathi Narasimhan (Bhanu Didi).Incidentally, she is none other than His sister.She was fortunate to be with the Master from His childhood. She affectionately recollects and narrates in a most beautiful style. It is more like a poetry than a biography. Tracing every turn of event in the early life of her Brother, Bhanu didi gives a graphic details of the numerous task He performed under Maharishi. Lecture tours and performances of Homas and Yagyas in the ancient Vedic tradition. These were of grand scale performed with short notices. The Master, after ten day silence and meditation started giving guided yoga and breathing exercises. These were profound techniques. People felt the blissful experiences. As time was unfolding ,the Art of Living foundation in Bangalore was born. It is one of modern day’s feat of chain of events.Millions have found their solace and comfort . 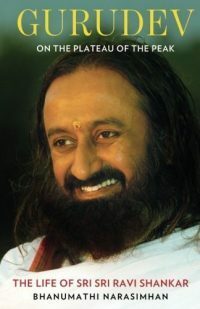 His presence and darshan of the Savior is enough.As the narration goes , one could feel the Divinity of Sri Sri Ravi Shankar (Guruji).The Dawn of Spirituality based purely on humanitarian values is here.There are many yoga practices in the Art of Living to uplift.Many report getting rid of their ailments after these! They truly inspire people of all ages. This book is very lucid and graphical. And brings out all the cultural and spiritual back drop unfolding of Guruji !I can read anywhere in the book and feel that I am with Him at that time. It makes compelling reading.As I read and experienced. It is a great work of Biography.Read the Book you and feel your connection with Guruji. Jai Guru Dev! He should get a Nobel peace prize for all the great work that he’s doing. I understand! But the people at the helm should decide. P.S. Did you buy and read this book? If not please do so!